This species is found in wet, often base rich habitats and appears to be extremely rare across Europe. It is not a very distinctive species, but its habitat requirements help in its identification. The main threats at the Garron Plateau are a lack of understanding of its ecological requirements, the wrong grazing regime, and any land use change that could lead to the site drying out. The cap of the fruiting body can be up to 10cm wide and the stem 10cm tall at its maximum. The cap is convex to fairly flat, sometimes with a depressed centre with age and it has a yellowish-brown to brown colour. The centre of the cap can be scaly and the edge of the cap can be striate with the gills visible through the cap. It is hygrophanous, coming much paler in colour when drying and quite thin with little flesh. The gills are cream to pinkish and can curve downwards where they join the stem, although often they join the stem at 90°. 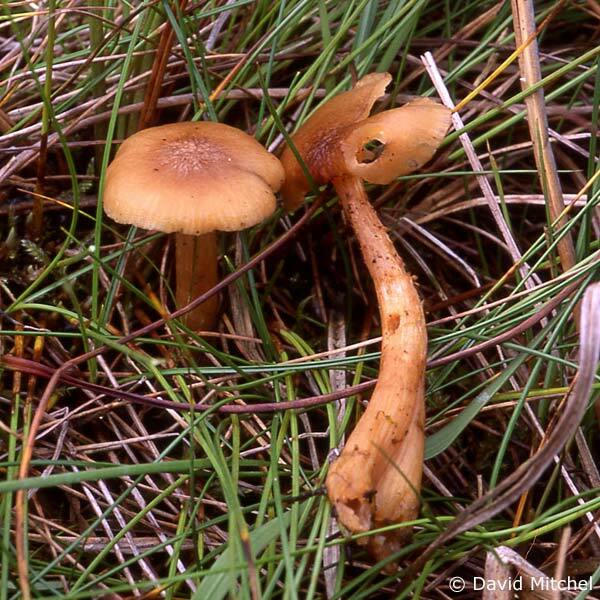 The stem is pale brownish and unlike the common honey fungus, has neither a ring nor rhizomorphs or ‘bootlaces’ attached to the base of the stem. It can grow in dense clumps or singly. It has a white spore print. It has been found in early to mid September on the Garron Plateau although in Great Britain, it has been recorded between July and October. Other species of Armillaria are noted by usually having a ring, distinct rhizomorphs or “bootlaces” extending from the base of the stem and a different habitat (usually in woods, gardens or on dead wood). In a fen or on a bog, fruiting body size, form (e.g. flat to convex cap often growing in clumps) and the white spore print rule out most other species with the exception of Tephrocybe (Lyophyllum) palustris which is smaller with a narrower stem and various species of Clitocybe which have to be carefully checked for microscopically. This has been found on the Garron Plateau east of Dungonnell Dam on the base rich flushes, between early to mid-September. This species could well be found elsewhere in the uplands of Northern Ireland or in base rich fens which have not necessarily been looked at by mycologists. Relevant access permissions should always be sought prior to visiting any sites. There are two old records of Clitocybe ectypa, a synonym of Armillaria ectypa, from Donard Park and Tollymore Forest Park from the 1880s. These records are, however, dubious as the habitat does not seem to match the requirements of this species unless the actual records were from the mountain flanks above these parks. The Garron Plateau record is its only confirmed Irish record and only one of four such records in the British Isles. Rare with 25% of UK population. The main threats are a lack of understanding of its ecological requirements, anything that may lead to the site drying out and possible changes in grazing pressure. Such flushes are often favoured places for sheep to graze and on one visit most of the fruiting bodies of A. ectypa were broken and damaged possibly due to sheep. There is a UK Species Action Plan for this species which was published in 1995. Implementation of the Northern Ireland Habitat Action Plans for blanket bog and fens. Bas, C. et al. (1995). Flora Agaricina Neerlandica Vol. 3. Leiden. The Netherlands. Ainsworth, M. (2003). 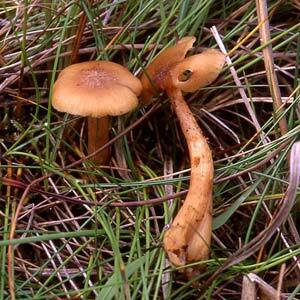 Report on the marsh honey fungus, Armillaria ectypa, a UK BAP species. English Nature Research Reports No. 540 English Nature Publications. Ainsworth, M. (2004). BAP Fungi Handbook. English Nature Research Reports No. 600 English Nature Publications. Evans, S.E. (2002). Conservation Corner. Field Mycology 3: 143-145.